Russell Mills and Edward Parsons were two important architects living and designing homes and commercial buildings in the Reno, Nevada area. 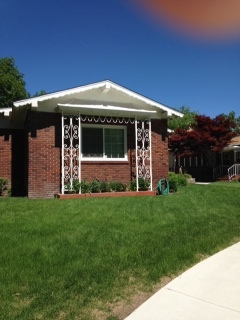 Their lives intersected, and as a result the Old Southwest area of Reno boasts some architectural gems. The Parsons/Mills walk is just one of the many historic home walks presented by the Historic Reno Preservation Society. This particular walk, presented by Anne Simone, focuses on the design styles of these two men. Anne has researched this topic so well that I want to share her wisdom on the lives of these two interesting and talented men with you. All credit for this article goes to Anne Simone, volunteer with the Historic Reno Preservation Society. Russell Mills: 1892-1959. Architect, a number of his works are listed in the U.S. National Register of Historic Places. Worked as a draftsman for Reno, NV architect Frederic DeLongchamps. Design works in Reno include Veterans Memorial High School, Veteran’s Elementary School, Job Ranch in Douglas County, Sparks City Hall, Brown Elementary School, Pershing County High School, and the J. Clarence Kind House. Russell Mills was born in Chicago 1892. His father, a retired military man, served in the 6th Cavalry as Sergeant Major. Russell’s mother, Alma, was of French descent and worked as a nanny for a general in the Philippines, China, and Japan. Alma and her husband split up and Russell, an only child, was raised by his mother. Because of Alma’s work, Russell traveled a great deal. The two finally settled in Oakland, California where he attended the Oakland public schools and was enrolled at the University of California, Berkeley (1913-1915). Little is known whether he graduated, or what academic program he was following, but since he went on to become a registered, and respected architect in Nevada, it seems likely that he at least attended architecture classes. In 1924, Russell Mills married Grace Culp, the daughter of a Methodist minister. She was also from the Bay Area. They had one child, named Rusty, in 1929. Although Russell Mills designed and built their home in Reno, he worked in San Francisco during the war years for the Navy Bureau of Yards and Docks from 1942-1945. One of the fun parts about being part of the Historic Reno Preservation Society, is that we are always adding new details and finding out more facts about the amazing historic homes in our old southwest neighborhood. Just recently a new home was added to this tour. It stands where the park was supposed to go in on the corner of Circle Drive and Manor Drive. However, World War Two erupted and plans for the park had to be put on hold, due to diverted funds to support the war effort. A fountain remains, marking the once hoped for public park. This area used to be covered by a field of violets back in the 1930s. Stunning to imagine. Now, it is a busy subdivision. Back to the historic home in question. Plans for the Russell Mills designed home were discovered in the attic of a nearby home of a longtime Reno resident. She graciously shared these plans with Anne and myself. So at least now we another proved home design to add to this delightful tour. Most of the home was remodeled outside and inside, and little remains of the original design. But, it stands as a remarkable tribute to Mr. Mills, and we are thrilled to add this to our tour. We also, were invited to tour another Russell Mills designed home. I was gobsmacked! It was like walking into a time capsule from the late 1930s! Most of the light fixtures were original to the home, as were the switches. I recently had to replace two dimmer switches in my home after a mere ten years, however the ones in this home have lasted, and continue to work for the past seventy-seven years. All the door handles and latches are the same as they were the day they were installed in 1937. The kitchen is original with original stainless steel counter tops. Now here is the kicker: the bathrooms are in their original condition, including the toilets and toilet seats, which are elongated and curved. One is blue and one is green. I couldn’t believe it. The tile in the bath surround is in terrific condition, with original ground marble grout in perfect condition. These homes are treasures. I was so impressed with this one. This home isn’t on our Russell Mills Ed Parsons home tour, but is featured on our Monroe Street walk. But, whenever we get the chance to talk about Russell Mills we do, even if it is to mention the roof. As Anne always says there isn’t a roof line Mr. Mills didn’t love. Edward Parsons: 1907-1991. Architect, the only northern Nevada awarded the American Institute Architects Fellowship. He also created the local branch of the AIA. Design works include: J. Clarence Kind house on the National Register of Historic Places, Incline High School, University of Nevada Reno building, Fleischmann Agriculture and Home Economics building, Orvis School of Nursing, Medical School building. Nevada State Capitol Building,Morrill Hall, University of Nevada, Reno, Bowers Mansion, Lake Mansion, Berlin Mill, Virginia City Courthouse, Belmont Courthouse, Genoa Courthouse, Fort Churchill. Edward Parsons father, Arthur Rose Parsons, was a metallurgical engineer, graduating about 1900 or 1902 from Leigh University in Pennsylvania. He built mine mills in Delamar, Goldfield and Tonapah for a mining company in the east. His mother, Laura Shier Parsons, attended UNR for at least two years, but records are unclear whether she graduated or not. Laura’s father was a pharmacist in Pioche, Delamar, and Milford, (perhaps Caliente). Arthur and Laura had two sons. The family lived in Tonopah where Arthur oversaw the mining. Edward Parsons younger brother went to Annapolis and had a military career. He made his home on the east coast. Arthur died of silicosis disease when Edward was eight years old. Laura died of pneumonia when Edward was about fourteen years old. Edward’s parents left money for the two boys. The paternal grandfather arranged to have the parents estate put in a trust fund, which covered the college funds for both boys. After graduating from the University of Pennsylvania with a degree in architecture, Edward Parsons looked for a job in Pennsylvania, but this was during the time of The Great Depression and work was scarce. This prompted Edward to look for work in Reno, Nevada and join his aunt and uncle there. He was in Reno three days when he landed the job with Frederic DeLongchamps. While in college Edward had designed side jobs Dan Kirkoff. Dan Kirkoff was the architect for Mrs. Willliam Johnston from the Palace Hotel in San Francisco. 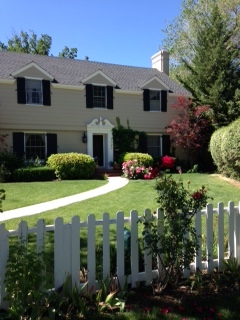 Mr. Kirkoff was commissioned by her to build French Provincial-style homes that we now see scattered around the Old Southwest Reno neighborhood. Now that Edward Parsons had returned to Reno he helped Frederic DeLongchamps finish up the Reno Post Office design. Edward was unsettled and went back and forth from Reno to San Francisco. Edward Parsons then joined with Russell Mills another notable architect. Russell Mills at this time worked for Home Owners Loan Corporation as a reconditioning supervisor and gave Edward an assistants job to inspect work under construction. Edward later said of Russell Mills, “He was a splendid person…had a charming personality.” Russell Mills and Edward Parsons teamed up to desing several homes at Lake Tahoe, around Carnelian Bay where Russell Mills had a home of his home with wife and child. Meanwhile Edward Parsons met Helen, his future wife, while playing Bridge in Reno. He later saw her again in San Francisco where she attened Mills College. After her graduation she was renting an apartment in Divisidero area of San Francisco, from Julia Morgan, the famous designer of San Simeon, where she had a studio and taught music. In September, 1938 Edward married Helen and they returned to Reno, eventually moving into the home Edward designed and had built in 1948, at 950 Marsh Street. The couple remained in that house and celebrated their fiftieth wedding anniversary there. When Edward Parsons went out on his own he began to number his designs. The Jack Halley house on Pueblo and Humboldt starting with #1. He was on #100 when he was drafted. Before the war he had designed a new cell block for the Nevada State Prison, a continuation of the original cell block that Frederic DeLongchamps had started years before. Due to the war the project couldn’t be completed because materials were diverted, however, after the war, the cell block was completed. Edward Parsons considered Reno, Nevada his home. He is the only Northern Nevada architect to be awarded the American Institute Architects Fellowship. Edward was known for his work in historic preservation and for creating the local branch of the American Institute of Architects. Russell Mills and Edward Parsons design collaboration. Now that the summer Olympics are over and the winning athletes have returned to their homes as medal bearing champions, my attention is focused on an entirely different champion this fall: The Giant Sequoia. How is a tree a champion? The Giant Sequoia, or Redwood is a champion of trees because it can grow to a staggering height of 300 feet and live 3,200 years! Reno, NV is home to the Giant Sequoia, or Giant Redwood. The Giant Sequoia can be seen growing in random places around the neighborhoods and public parks of Reno, but the oldest was planted in 1939 and is considered a landmark tree. Even at the age of seventy-three, the Sequoia is a mere sapling. 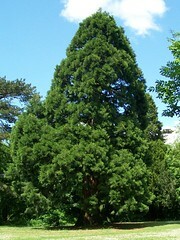 It will take another thirty years, or when the tree reaches a hundred years or so, that the top, or crown, will begin to flatten out, and take on that unique Giant Sequoia look that sets it apart from other firs and pines. With age its branches will become heavier and denser (kind of like humans). Of course the Giant Sequoia that grow in Reno have been planted by people. While they are native to the Sierra Nevada, California I don’t believe they grow naturally here, however Reno’s cold weather climate during the winter months seems to sustain their growth. Have you explored the urban forest where you live. I would love to hear about the landmark trees you’ve discovered. If you think Reno, Nevada is just a smaller version of Las Vegas then you don’t know Reno! Some people think all there is to do here is gamble and eat at the enormous buffet’s presented by the casino’s. There’s a bit more to it than that. When I first moved to Reno, NV, almost nineteen years ago, I didn’t think much of the place. In fact, I thought it was unattractive and boring. I happened to mention this to an older lady, a longtime resident of Reno. She looked at me and said, “Well, you don’t know history then. Reno is full of history.” This shocked me a little (alright, it shocked me a lot). That little old lady was right: I knew nothing about the part Reno played in U.S. history. But, I wanted to find out. I’ve been learning a little bit here and there, and I plan on sharing these findings with you and we can enjoy the journey of discovering Reno together. That’s what I have to say. What do you think about the city where you live?